This month we just March right into Easter. 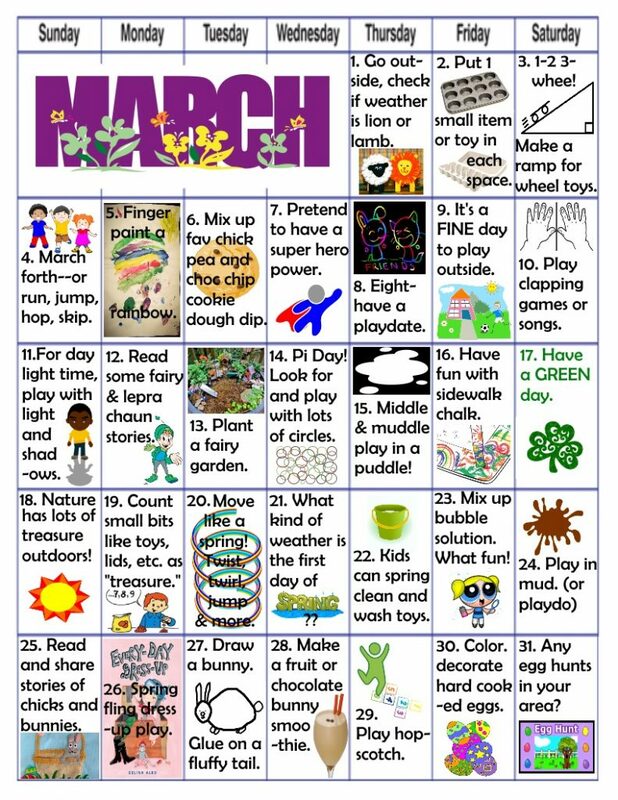 The rest of the month is a treasure of more fun and learning play activities for kids. You can enjoy these both inside and out. Print off the calendar and put it on the fridge door or somewhere handy. 1, 2, 3,…let’s play. Fairy snacks are fun and easy to make with fruit. We made fairy magic wands and fairy berry smoothies too. They are nutritious and yummy to eat. 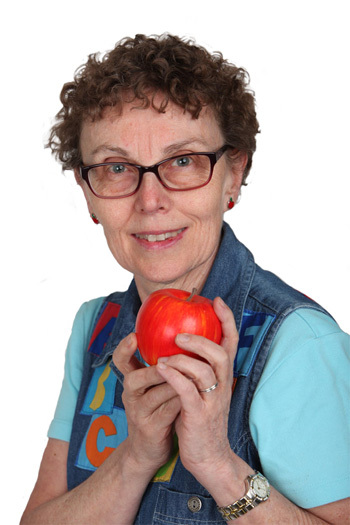 Fairy fruit magic wands can use almost any fruit you have at home. 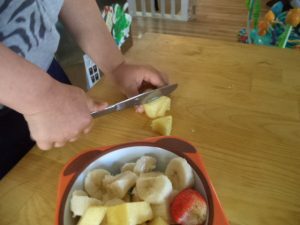 After washing our hands so we couldn’t taste any fingers, Big Brother helped slice a banana while I topped some strawberries. 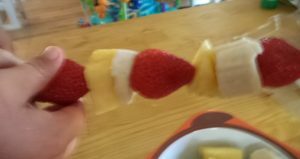 Together we made one magic wand with strawberry, banana, and pineapple chunks on a skewer. We put them on in a pattern: strawberry, pineapple, banana/strawberry, pineapple, banana. Then, Big Brother made his own. He chose to use only strawberries and bananas and, for the most part, put them on in a pattern too. Patterning is an important thinking skill. It helps reduce the volume of information so, whenever possible, we play with pattern sequences. Kids need lots and lots of experiences to figure out how patterns work. 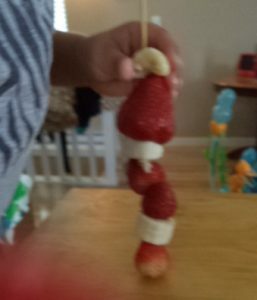 After making the fairy fruit magic wands, we slid the fruit back off the skewers and ate them up. Berry and fairy sound almost the same. 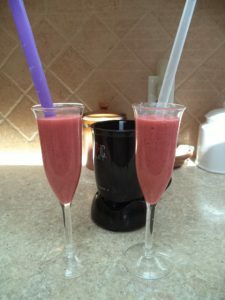 To make the smoothies, we used raspberries and strawberries. Blackberries aren’t ready yet here but they would be good too. So would blueberries. After washing hands and fruit we added them to the blender with some yogurt and a bit of honey. Blend until smooth, pour into cups, and slurp with straws. Cooking with kids encourages more skills than patterning and rhyming words. 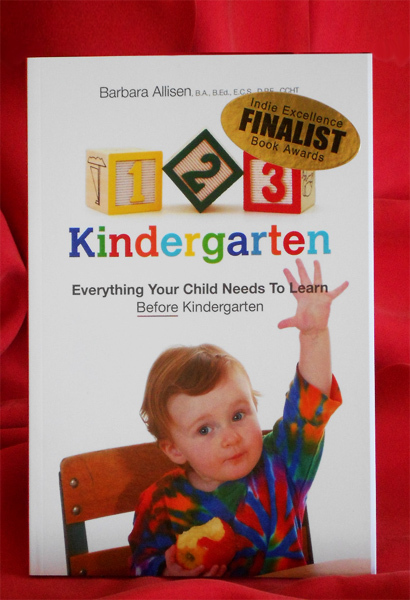 There’s following instructions, doing steps in order, basic science, special language, measuring, counting, comparing, and others. When children are involved with food preparation, they are more aware of what they are eating and more open to trying new foods. They develop a partnership with foods instead of only consuming them. Being part of the preparation and the clean-up also promotes a feeling of satisfaction and accomplishment. We all enjoy being part of the group, kids included. They feel they are able to contribute to the family too. These fairy snacks were easy and healthy. Magic wands weren’t needed for taste, but added to the fun. Any kitchen fairies at your house? 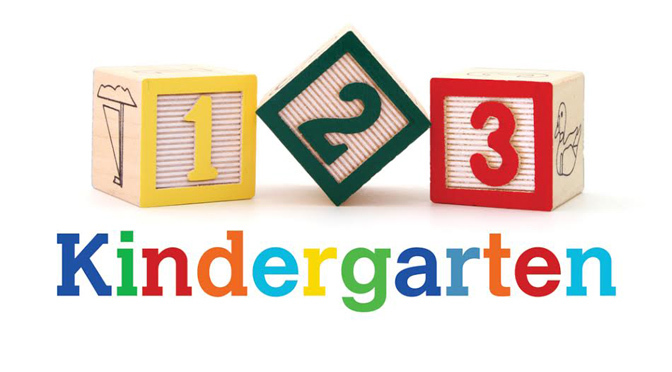 For more fairy fun, from snacks to science to stories to songs, visit the plays-of-the-day on 123kindergarten blog. 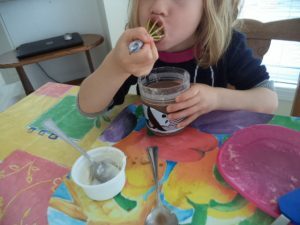 Since our cooking in the kitchen is often pretty messy, this kids’ chocolate smoothie messy play wasn’t so different, and the messy was yummy and playful. Making bread requires hands to be totally involved in the mixing and kneading so it’s not so far-fetched to have a child be really hands-on when making a smoothie. Of course, to make this one Little Sister did wash her hands well. 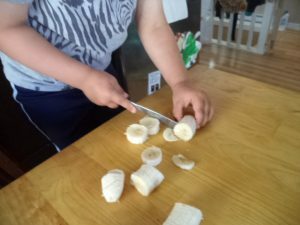 Once kids have washed their hands, have them peel a banana. Place the banana on a freshly cleaned tray or big plastic plate. 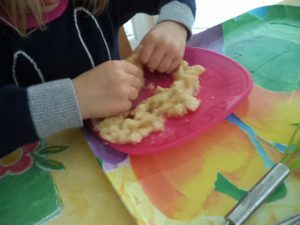 With fingers, kids squish and smooth the banana until it’s all mushed up, almost like finger paint. Since their hands and the dish are clean, they can smooth the banana around and draw in it if they want. With fingers or spoon, they can also add in some thick, creamy yogurt and mix it in with the banana. Once kids have played sufficiently with this mess, they scoop up the banana yogurt mush and put it in a glass or cup. They may need some help getting the good stuff off the tray. Before going on to the next part, Little Sister wanted to wash her hands because her fingers were so slippery. We poured some chocolate milk into the cup with the banana and yogurt mixture. Using a small whisk, Little Sister stirred it together. It was smooth enough to drink, but not as much fun as slurping it off the whisk. This was a variation on licking-the-beater but fit better in her mouth. 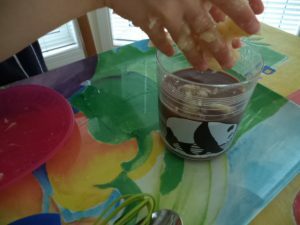 Messy play is often very sensory, and this chocolate smoothie messy play activitywas both. At first, Little Sister liked the feeling of squishing the banana but then wanted to wash it off. Much like adults do with dough. Food preparation often includes making a mess and cooking with kids helps them develop a positive connection to food and encourages healthy choices. After this, washing up was another sensory experience. Maybe we could say it was de-messy play?